BIRDscapes Gallery at Glandford near Holt has an exhibition commencing 12.00 on Saturday, 9th July. It closes on the 24th July. 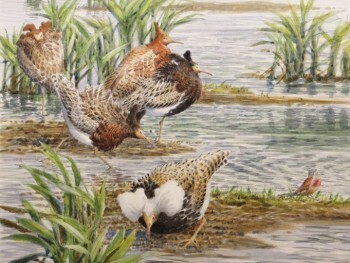 This exhibition features works by Michael Warren SWLA, one of the UK’s best known bird artists. His instantly recognisable style is based on a huge amount of time spent in the field observing and sketching, enabling him to catch the essential character of his subjects. Mike’s international reputation has led to his painting in many parts of the world, including every U.S. state! A frequent visitor to North Norfolk, which features in this collection, he is also a dedicated ‘local patch’ painter. His latest book, Taking Flight documents the birdlife of Langford Lowfields as it evolved from working gravel pit to bird rich nature reserve.